A.R. 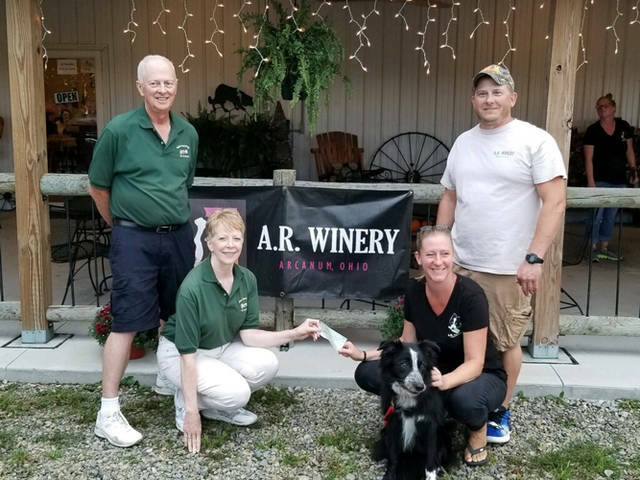 Winery donated to the Darke County dog park, Scentral Park. Pictured (l-r) are Bob Harshbarger, Jeanie Harshbarger, Fuel, Angie Rex and Russell Rex. GREENVILLE – A.R. Winery is all about the animals. Since opening three years ago on Labor Day weekend, A.R. Winery’s patrons have been donating to the Fuel Fund. The owners, Russell and Angie Rex, decided that they were going to help the animals as much as they could each year. The fund is named after their 5-year-old old Border Collie, Fuel. He’s on every one of their wine labels and is well known in the sport of Flyball. This year, the Fuel Fund raised donations for the Darke County dog park, Scentral Park. Scentral Park is more than 3 acres in size and features walking trails, off leash areas for small and large dogs, seating benches and ample parking. The park is open from daylight to dark and is available to all (located on County Home Road, beyond the Sheriff’s Department in Greenville). The donations will help maintain the grounds and keep this park looking fabulous for all to enjoy.